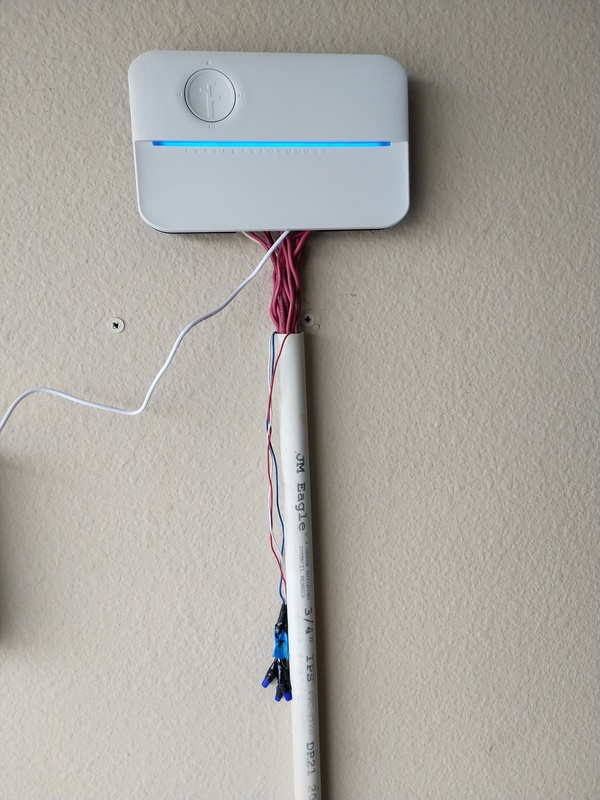 I’m going from a Rainbird controller with hardwired power to the Rachio with the AC adapter, so I need help properly tying off/securing/getting rid of the now unused and white wires. I’ve tied them off with wire nuts, but I’m not really sure how to tidy it up more than what you see in the pictures. I also have a feeling that it’s potentially unsafe to leave them hanging down like that. @godplaysdice - those wires look too thin to be caring 120 VAC, so I’m thinking they’re connected to a transformer somewhere down the line. If you have access to a volt meter I’d check the voltage potential between the pairs - probably red and white will show voltage. It the voltage potential is 24 VAC, then there is a transformer somewhere. I’d find that transformer and disconnect it - the line side of the transformer will be 120 VAC. If there is no voltage potential across any of the wires, then these may be leading to an accessory device - I say that because of the blue wire. Normally the a ground wire will be green. 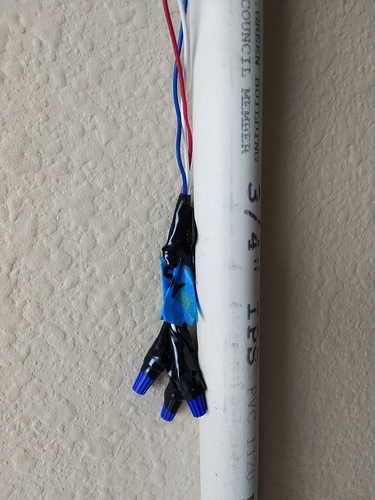 Is there a before picture by chance of the wiring in the Rainbird - or a post of the Rainbird model number might help confirm things. Sorry, the old controller was actually a Hunter Pro C. I always get rainbird and Hunter confused for some reason. Anyhow, here is an ok pic that I took. You can see the red wire going into the terminal marked “AC1”, the white into “AC2”, and the blue into “REM” (remote, not sure what that’s for). Ignore the chunky white wire with several thin wires coming out of it since that was just the power supply to a rain sensor that I discarded. According to the Pro C manual, it runs on 24V. @godplaysdice - Thanks for the picture! My guess is the two yellow wires actually carried the 24 VAC - as they are paired with the green ground wire. And, the red, white and blue wires are all for the remote (the red and white carried 24 VAC to the remote controller receiver from the Hunter and the blue is the command line coming from the remote controller receiver to the Hunter. 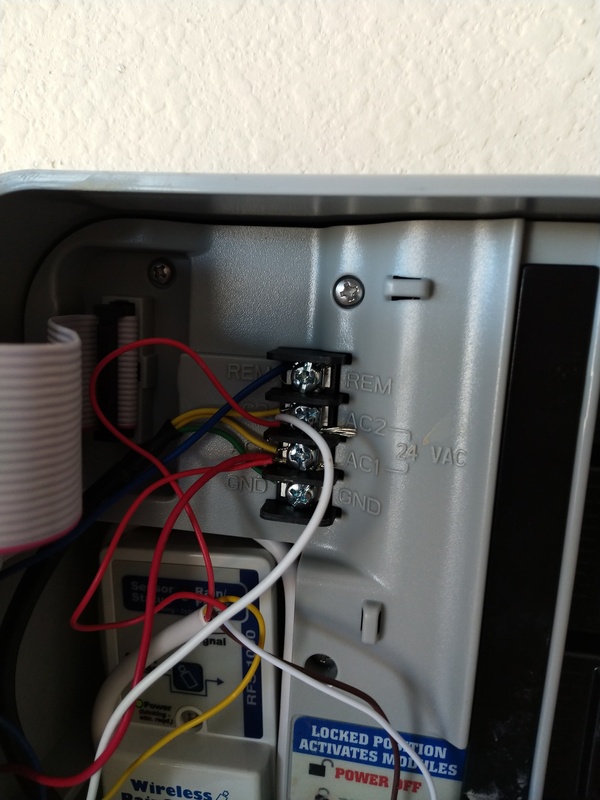 Therefore, I don’t think you’ll find any voltage potential across any of those three wires and they can be abandoned in place, pulled out or cut-off to clean up the install. Oh wow I’m a real dummy…your comment inspired me to take a second look at the Hunter manual, and after rereading the Hunter manual I believe you are 100% correct. I’ll test the red, white and blue wires to confirm that they are indeed NOT live and then proceed merrily from there. Thank you very much!